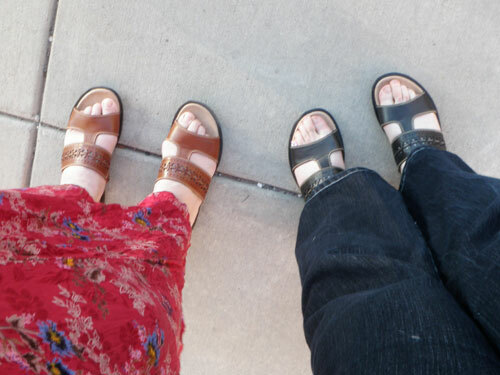 More frightening than the fact that my mother and I bought the same type of sandals at Kohls (on sale!!) is that I figured this out by the sound they made on the pavement. Yes, BY SOUND. Most people have to go blind to develop super-hearing, but not I. We were walking to a restaurant last night when I heard that SQUISH sound my left sandal has been making, except it wasn’t in time to my own footsteps. I started to alter my pace to make sure it really wasn’t me squishing and squashing down the street, and that’s when I thought to take a look at my mom’s feet. So, yeah, I am becoming my mother. But at least we chose different colors, and I certainly did not get the black pair just because they didn’t have a size 9.5 in orange. Certainly, totally, definitely not. Damn… I was looking at either the green or the purple, but they didn’t come in my size either! Poor sizing saved me from squeaky sandals for the win! Great minds… I swear I tried on these shoes a few weeks ago. I was going for the more boring brown though. Goodness, those shoes look comfy. Are they comfy? I could use comfy shoes. When my sister and I go shopping we make a point of asking each other if the item we like is something that mom would buy. That’s our que to put it back. We live over 600 miles from each other and still end up buying the same shirt, same sweater etc. Amazing. I find the older I get, the more I become my mom. I’m not sure why it’s so hard to accept – my mom was a wonderful woman. I just never wanted to turn into her. I guess maybe, it’s payback for all the times I thought she was so out of touch and nerdy. Now I get to be the nerd! haha. i recently bought a sweater having spent ages dithering about it wondering if i looked like my mother while wearing it. then i wore it in front of her and i got the first compliment i’d had from her in MONTHS on its style. noone else has ever complimented me on it. @Bethama – They are pretty comfy. I was looking for summer shoes that gave my foot more support than my flip-flops, which they do. My only complaint is that my left pinkie toe rubs against the strap, which hurts my skin. I have a band-aid on and with that it feels fine. My mom hasn’t had any problems with them. OMG!!! I bought the same shoes a week ago and they do SQUISH and make a sound like air wooshing out when I walk. So annoying! @ SG – too funny!! This post made me smile! My mom bought a shirt last weekend and showed it to me when I was visiting, asking me whether I thought it was “too old lady-ish.” I told her no, and that I in fact thought it was quite cute … yeah, then I went out and bought the exact same shirt later that day. I don’t know what that says about me. But yeah, cute shoes. And I like how you’re both wearing – appear to be wearing? – long skirts with them. Once long ago and far away I went shopping with my mom and my memere and we all got the same pair of pumas. It was kind of awesome actually. Regarding where to find boxes (just catching up on your blog posts and read that you’re moving) try Freecycle and ask for free boxes. You’ll be suprized how many you can get this way. It’s all free and a great place for people to give stuff away instead of putting it in a landfill. You might list your furniture that you’ll be getting rid of. There’s always someone who will want a 10 year old mattress and bed and be grateful you gave it away! I bought those shoes in Austin Texas, and mine squoosh, too! no wonder they were only $12! Does it stop me from wearing them? No way! Love it! My mom and I were chatting on the phone one day (you know, trying to outdo the other on having the worst day ever) only to discover that not only had we just gone to the dentist, but we had a root canal done on the same tooth. And, we both later lost that same tooth and had to have it pulled. I’d rather wear the same shoes. Which we do. I remember from long long ago a photo of your feet where the toes looked a little bent and odd, yet in this photo they look totally normal. (Sorry if that sounds rude – they weren’t that weird! but you commented on them at the time.) Anyway, I was wondering if the weight-loss straightened your toes, or these shoes are extra-supportive, or just that old photo was not at your best angle? Oh, and I think the only time my mum (we spell it mum not mom in Australia, and mummy not mommy) has ever complimented me on my clothes is if I was wearing one of her cast-offs. I dig them out when she visits, its the only way I can get her to say something nice about my appearance. I have the same shoes and was sooooooooooooo disappointed when I started hearing the squishing sound only after I had worn them outside and didn’t think I could return them. Beware if they get wet! Then they are really loud! My niece named my shoes squishy and squashy as we walked back to the house from the pool! we are so alike at the CORE but the exterior trappings are wholllly different. @Natalie – No, my toes are still crossed. If I’m standing up, the weight of my body presses them down so they don’t look as crossed. I’m sorry, at your age you should not be wearing anything your mother is wearing. Sorry again. Believe it or not, there are apparently whole message boards devoted to making that sound in shoes go away, using powder, oil, etc. And the suggestions work–one of my running shoes made an annoying squeaking sound and powder under the insole fixed it. But even sandals without removable insoles can be hacked to be noise-free. I think it’s fine that you bought the same shoes. Hey, your color is edgier! I would be shocked if I bought the same thing as my mom (she is over 40 years older). But in other ways I am becoming more like her and as I get older I appreciate it. Is this happening to you too?